CAPTION: From topics dealing with agriculture and amnesty to carbon tax and tax credits, U.S. Sen. Claire McCaskill (standing at left) fields questions asked by dozens of individuals gathered at the Litton Agri-Science Learning Center today. 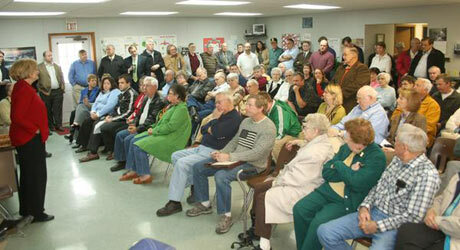 The senator’s “Kitchen Table Talks” drew a crowd of more than 100 people from at least a seven-county area. The senator planned to be in Rolla and Osage Beach later today. Although eggs and bacon weren’t part of this morning’s breakfast fare, the price of produce and the size of government pork were included in a smorgasbord of issues addressed by U.S. Sen. Claire McCaskill who brought her Kitchen Table Talks to Chillicothe today. Gathered at the Litton Agri-Science Learning Center off of Missouri Route 190 northwest of Chillicothe, more than 100 people from at least a seven-county area attended and brought with them questions dealing with issues ranging from agriculture and amnesty to carbon tax and tax credits. In addition to members of the general public, the crowd included elected officials, farmers, and representatives from cities and counties, electric companies, health care fields, banking, education, senior citizens and more. McCaskill’s Chillicothe stop was the first of three she was making throughout the state today. She planned to be in Rolla at 3 p.m. and at Osage Beach by 6 p.m. Earlier this week, she took her Kitchen Table Talks to St. Charles, Franklin County, Sikeston, Joplin, Clinton, Independence, Maryville and Kirskville. She told those gathered that she appreciated their interest in coming to the event and welcomed all their questions. She reminded them that although other states may have greater populations than Missouri, the two senators from New York have just as much say as the two from Montana. McCaskill fielded more than a dozen questions from those gathered. They asked her about the future of the postal services industry, proposals for mandatory animal ID, spending bills, proposed carbon taxes, highway funding, stimulus funds, energy legislation, reductions of earmarks, accessibility of health care for all Americans and improvements in the health insurance industry, controlled congressional spending, government contract oversight, amnesty and more. She was also asked about how various entities can pursue federal stimulus funds. Since elected to the Senate, McCaskill’s office has put on hundreds of Kitchen Table Talks where either she or her staff have met with residents to hear their concerns and share ways her office can be of service to Missourians. Currently, the senator has staff in Cape Girardeau, Columbia, Kansas City, Springfield, and St. Louis. The Kitchen Table Talks serve, in part, to inform area residents of the services that are available to them when they contact one of her regional offices. Chillicothe Mayor Chuck Haney welcomed those in attendance today and introduced the senator.